The NPC Deck is a deck of cards for Faith: The Sci-Fi RPG with 54 non-player character cards for the Game Master to enrich the experience of the game. 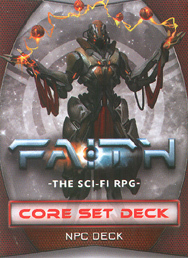 Faith: The Sci-Fi RPG is a RPG that uses board game tools such as cards to enhance the experience of play and put the art on the table. Create fascinating confrontations for your players using the NPCs found in this deck. All the information you need to use each NPC as well as an illustration for visual reference is contained within its card.